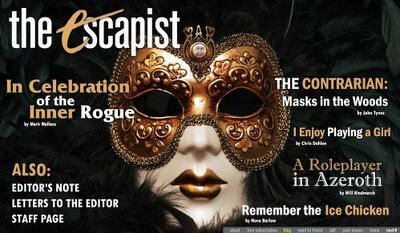 The Escapist #30 was released yesterday. This week they cover how the gaming industry was influence, and still is, by pen-based Roleplaying Games. Makes for a great read for any of us who's ever played D&D, AD&D, MERP, Traveler. Boy does it ever bring back memories. This is one issue you definitely do not want to miss. Is the avatar separate from you, or is it an extension of yourself? Why? Why not play someone completely different from yourself! Also see my earlier post on the subject. With computer based RPG, we've gained a lot in terms of the visuals, but at what cost? Is it limiting our imagination or making it boundless? It's a whole new experience out there! Gaming: World of Warcraft, the new golf course?